There’s a new deal for those looking to get a new Pixel 2 or Pixel 2 XL. If you’re looking at Verizon, you should head over to Best Buy to take advantage of the following deal. 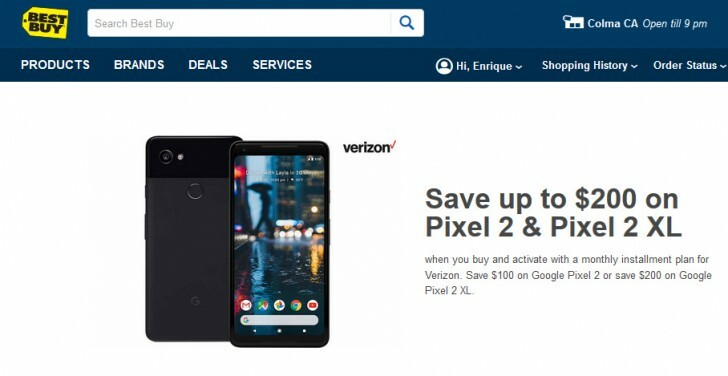 Save $200 when you purchase a Google Pixel 2 XL on Best Buy’s website with a monthly installment plan on Verizon. You can also save $100 if you purchase the smaller Pixel 2. The 64GB Pixel 2 normally goes for $27.08 per month. With the $100 off, the payment goes down to $22.91. Meanwhile, the Pixel 2 XL with 64GB of storage normally goes for $35.41 per month, down to $27.07 per month after the discount. The discount applies to either storage configuration of the Google Pixel 2 or Pixel 2 XL. Just so you know, this deal is only valid at Best Buy in-store or online when you purchase and activate a Pixel 2 on Verizon with an installment plan to pay it off, you won’t be able to buy it in full. Offers like these are normally for a limited time and the deal can be called off at the retailer’s discretion. Even with the first Google Pixel (XL) last year, Verizon always offered discounts throughout the year. Chances are if you miss this deal, there will likely be a new one rolling around soon enough.